رحیمی, ندا, غلام زاده, عباس. (1396). برآورد رابطه وابستگی فرکانسی ضریب کیفیت امواج فشارشی در جزیره قشم. مجله ژئوفیزیک ایران, 11(2), 110-118. ندا رحیمی; عباس غلام زاده. "برآورد رابطه وابستگی فرکانسی ضریب کیفیت امواج فشارشی در جزیره قشم". مجله ژئوفیزیک ایران, 11, 2, 1396, 110-118. رحیمی, ندا, غلام زاده, عباس. (1396). 'برآورد رابطه وابستگی فرکانسی ضریب کیفیت امواج فشارشی در جزیره قشم', مجله ژئوفیزیک ایران, 11(2), pp. 110-118. رحیمی, ندا, غلام زاده, عباس. برآورد رابطه وابستگی فرکانسی ضریب کیفیت امواج فشارشی در جزیره قشم. مجله ژئوفیزیک ایران, 1396; 11(2): 110-118. علم زلزله‌شناسی به کمک مطالعه نگاشت‌های ثبت‌شده حاصل از امواج زمین‌لرزه، نقش مهمی در شناسایی وضعیت و ترکیبات داخل زمین که امواج لرزه‌ای از داخل آن عبور می‌کنند، ایفا می‌کند. انرژی امواج لرزه‌ای در هنگام عبور از زمین با افزایش مسافت بین چشمه و گیرنده کاهش می‌یابد. کاهندگی امواج لرزه‌ای در لیتوسفر به‌عنوان یکی از ویژگی‌های مهم جهت مطالعه ساختار داخل زمین و یکی از راه‌های شناسایی ویژگی‌های لرزه‌خیزی و ارتباط آن با تکتونیک در یک منطقه شناخته می‌شود. تعیین ضریب کیفیت در درون زمین با مطالعه کاهندگی امواج لرزه‌ای امکان‌پذیر است. می‌توان کاهندگی لرزه‌ای را به‌صورت اُفت دامنه امواج لرزه‌ای نسبت به زمان و فاصله توصیف کرد. به طور کلی دامنه موج لرزه‌ای با افزایش فاصله درون زمین کاهش می‌یابد. به‌جز مواردی که تداخل امواج رخ می‌دهد، دامنه نسبت به فاصله به‌طور نمایی کاهش می‌یابد و مقدار افت آن متناسب با Qp-1 است که مشخصه مکانی موج P است. گستره مورد مطالعه، جزیره قشم با طول متوسط 132 کیلومتر و عرض متوسط 4/11 کیلومتر است که در بخش خاوری رشته‌کوه زاگرس قرار گرفته‌است. زمین‏لرزه قشم با بزرگای 0/6 = mb در ششم آذرماه 1384 در ساعت 10:22:19 (UTC) در مختصات جغرافیایی 83/26 درجه عرض شمالی و 82/55 درجه طول شرقی توسط 17 ایستگاه شبکه ملی لرزه‌نگاری پژوهشگاه بین‌المللی زلزله‌شناسی و مهندسی زلزله به ثبت رسید. در این مطالعه جهت برآورد رابطه وابستگی فرکانسی ضریب کیفیت امواج P به روش نرمالایز کدا، از 661 پس‏لرزه به‌دقت تعیین محل شده، استفاده شده است. در این روش ضریب کیفیت امواج طولی در 9 بازه فرکانسی، 5/1- 5/2- 5/3-5 – 7 – 10 – 14 – 19 -24 هرتز در منطقه قشم تعیین شدند. رابطه وابستگی فرکانسی به‌دست‌آمده برای امواج طولی در منطقه مورد مطالعه به‌صورت است. به این ترتیب کاهندگی منطقه قشم به نسبت بسیار زیاد است که می‌تواند دلالت بر این داشته باشد که مواد تشکیل‏دهنده پوسته زمین بخش زیادی از انرژی امواج تراکمی را مستهلک می‌کنند. این کاهندگی زیاد، با توجه به مقادیر گزارش‌شده برای سایر نقاط ایران و جهان، بازتابی از حضور یک لایه رسوبات نسبتاً نرم هم‌چون گنبدهای نمکی است؛ همچنین می‌تواند به دلیل داده‌های استفاده شده پس‌لرزه‌های زمین‌لرزه 6 آذرماه ‌باشد که منطقه دچار خردشدگی و بالتبع افزایش ناهمگنی شده است. مقدار ضریب کیفیت در بسامد مرجع 0/1 هرتز کمتر از 200 است. بنابراین می‌توان نتیجه گرفت این منطقه از لحاظ لرزه‌خیزی و زمین‌ساختی فعال است. نتایج با خصوصیات زمین‌شناسی و ساختار رسوبی منطقه مطابقت دارد؛ در این بخش از زاگرس تجمع گنبدهای نمکی به وفور یافت می‌شود. Seismology has an important role in identifying earth structure by studying seismic waves. The amplitude and frequency of these waves change when they pass into the earth due to various parameters including anisotropy and heterogeneity. Seismic waves decay as they radiate away from their sources, partly for geometric reasons because their energy is distributed on an expanding wave front, and partly because their energy is absorbed by the material they travel through. The energy absorption depends on the material properties. The amplitude of seismic waves decreases with increasing distance from earthquake, explosion, and impact sources. How this amplitude decrease occurs and how rapidly it occurs and how it depends on the frequency of the seismic waves is fundamentally important to the efforts to describe Earth structure and seismic sources. Attenuation of seismic waves is expressed with inverse quality factor (Q-1) and helps understand the physical laws governing the propagation of seismic waves in the lithosphere. The observed seismic-wave amplitudes usually decay exponentially with increasing traveled distance after the correction for geometrical spreading, and decay rates is proportional to Q−1 which characterizes the spatial attenuation for P-wave. An earthquake with magnitude Mw 5.8 occurred on Qeshm Island, on the western edge of the Strait of Hormuz in SE Zagros, on November 27, 2005. From 2005 December 2 to 2006 February 26, a dense seismological network of 17 stations was installed in the epicentral region of the 2005 November 27 Qeshm sequence. In this study, 661 aftershocks were selected to estimate the frequency dependence relationship of the quality factor of P-wave with coda normalization method. The coda normalization method was used for the estimation of the quality factor of the longitudinal waves at 9 frequency band (the central frequency: 1.5, 2.5, 3.5, 5, 7, 10, 14, 19, 24). The frequency dependence relationship for the longitudinal waves are Qp = 0.059f -0.94 in the study area. As reported from other parts of world and Iran, the high value of attenuation in Qeshm may be because of the presence of some soft sediments such as a salt dome. Another reason for this high attenuation, probably due to using aftershocks data. After main shocks occurred, the medium must smash and cracked, and as a result, more heterogeneity and consequently, attenuation increase. The quality factor at a reference frequency of 1.0 Hz is less than 200. Therefore, it can be concluded the area is very active in terms of tectonic plates and seismicity which represents the accumulation of salt domes in this part of Zagros. Alavi, M., 1994, Tectonics of the Zagros orogenic belt of Iran: new data and interpretations: Tectonophysics, 229, 211-238. Berberian, M., 1995, Master blind thrust faults hidden under the Zagros folds, active basement tectonics and surface morphotectonics: Tectonophysics, 241, 193-224. Chung, T. W., and Sato, H., 2001, Attenuation of high-frequency P and S waves in the crust of Southeastern South Korea: Bulletin of the Seismological Society of America, 91(6), 1867-1874. Farzanegan, E., Mirzaei Alavijeh, H., and Sinaeian, F., 2006, the earthquake report in Qeshm Island (Persian Gulf) at november 27, 2005: Building and Housing Development Research Center. Haghipour, A., 2006, Geology of Qeshm, Qeshm Free Zone Organization Publication: P. 5. Kinoshita, S., 1994, Frequency-dependent attenuation of shear waves in the crust of the southern Kanto area, Japan: Bulletin of the Seismological Society of America, 84, 1387-1396. Kumar, N., Mate, Sh., and Mukhopadhyay, S., 2013, Estimation of Qp and Qs of Kinnaur Himalaya: Journal of Seismology 18, 47-59, DOI 10.1007/s10950-013-9399-7. Ma’hood M., Hamzehloo H., and Doloei G. J., 2009, Attenuation of high frequency P and S waves in the crust of the east-central Iran: Geophysical Journal International, 179, 1669–78. McQuarrie, N., Stock, J. M., Verdel, C., and Wernicke, B., 2003, Cenozoic evolution of Neotethys and implications for the causes of plate motions: Geophysical Research Letters, 30(20), 2036-2040. Mirzaei, N., Gao, M. and Chen Y. T., 1998, Seismic source regionalization for seismic zoning of Iran: major seismotectonic provinces. Journal of Earthquake Prediction Research 7, 465-495. Nissen, E., Ghorashi, M., Jackson, J., Parson, B., and Talebian, M. 2007, The 2005 Qeshm Island earthquake (Iran) – a link between buried reverse faulting and surface folding in the Zagros Simpl y Folded Belt: Geophysical Journal International, 171, 326–338. Nowroozi, G., 2006, Seismological constraints on the crustal structure of NE Iran: Ph. D. thesis. International Institute of Earthquake Engineering and Seismology, Tehran. Parvini, M., 2007, Description of the plan Regulations structures against earthquake (2800 standard): Simaye-Danesh Publication. Rezaee, P., and Zarezadeh, R., 2014, Carbonate Marine Terraces of Qeshm Island, a Symbol of Sea Level Changes of the Persian Gulf in the Quaternary: Scientific Quarterly Journal, Geosciences, 23(92), 67-68. Sato, H., and Fehler, M. C. 1998, Seismic Wave Propagation and Scattering in the Heterogeneous Earth: Springer Verlag, New York. Sharma, B., Gupta, A. K., Devi, D. K, Kumar, D., Teotia, S. S, and Rastogi, B. K., 2008, Attenuation of high-frequency seismic waves in Kachchh region, Gujarat, India: Bulletin of the Seismological Society of America, 98, 2325–40. Tatar, M., Hatzfeld, D., Martinod, J., Walpersdorf, A., Ghafori-Ashtiany, M., and Chery, J., 2002, the present-day deformation of the central Zagros from GPS measurements: Geophysical Research Letters, 29(19), 1927-1931. Vasheghani Farahani, J., Zare, M., and Cichowicz, A., 2012, Attenuation of high-frequency P and S waves in south and southeast Tehran using blast data: Soil Dynamics and Earthquake Engineering, 40, 99-108. 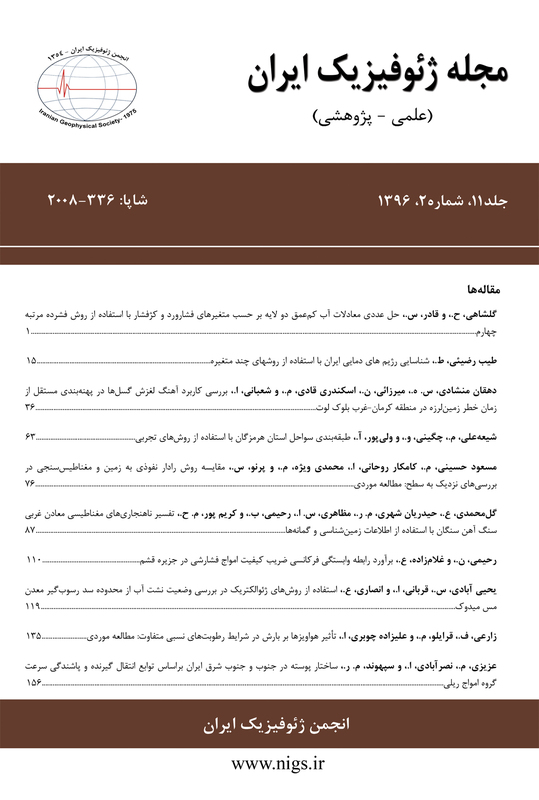 Vernant, P., Nilforoushan, F., Chery, J., Bayer, R., Djamour, Y., Masson, F., Nankali, H., Ritz, J. F., Sedighi, M., and Tavakoli, F., 2004, Deciphering oblique shortening of central Alborz in Iran using geodetic data: Earth and Planetary Science Letters, 223, 177-185. Yaminifard, F., Tatar, M., Hessami, K., Gholamzadeh, A., and Bergman, E. A., 2012, Aftershock analysis of the 2005 November 27 (Mw 5.8) Qeshm Island earthquake (Zagros-Iran): Triggering of strike-slip faults at the basement. Journal of Geodynamics, 61, 138-147. Yoshimoto, K., Sato, H., and Ohtake, M., 1993, Frequency-dependent attenuation of P and S waves in the Kanto area, Japan, based on the coda-normalization method: Geophysical Journal International, 114, 165-174.